Piqua’s Mick Karn outraces the Butler defense. Piqua’s Qurri Tucker drives between two Butler players Tuesday night at the SAC. Piqua’s Kameron Darner goes up for two points. 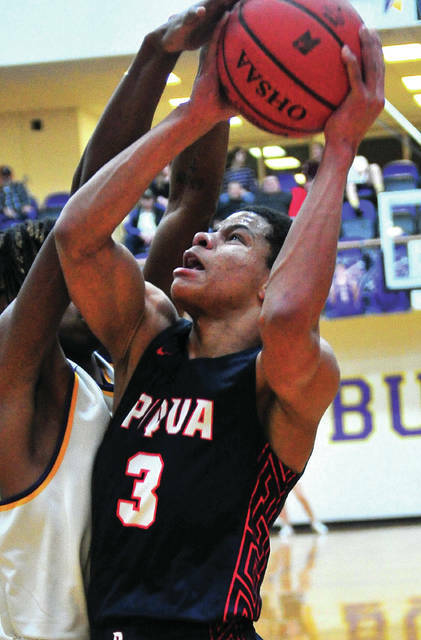 Piqua’s Trey Richmond looks to shoot Tuesday night against Butler. Piqua’s Iverson Ventura is fouled as he shoots against Butler Tuesday night. VANDALIA —- The final score would not indicate it. 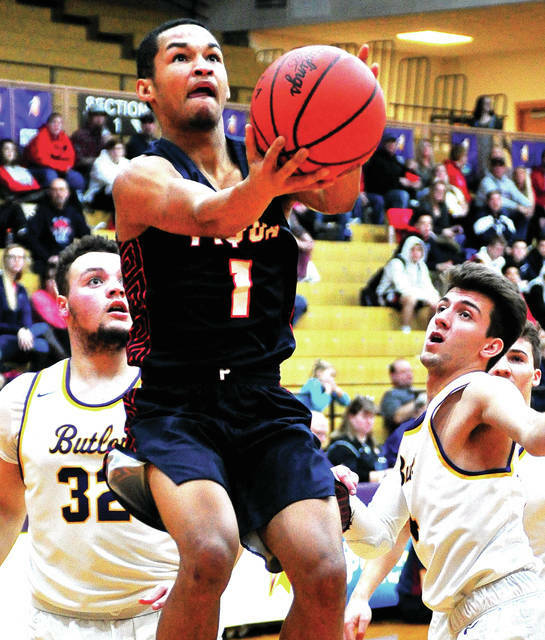 But, the Piqua boys basketball team showed much improvement in its second meeting with Butler Tuesday night in GWOC American action. 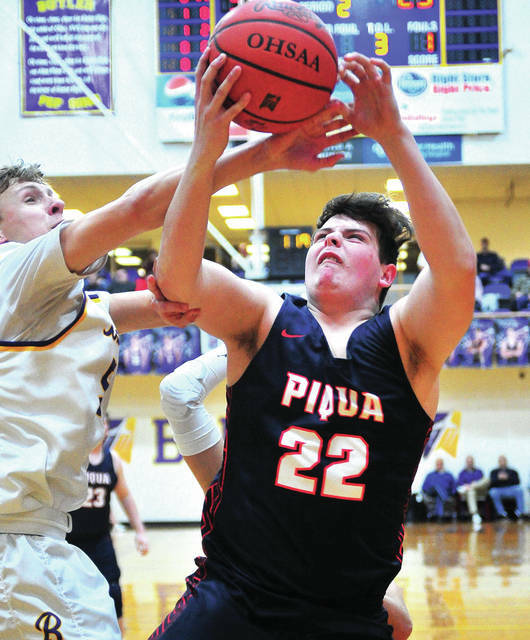 Piqua had lost to Butler 72-38 in the season opener —- and lost Tuesday at the SAC 72-49. But, the Indians stayed close for the first three quarters and trailed by just 10 with six minutes remaining. 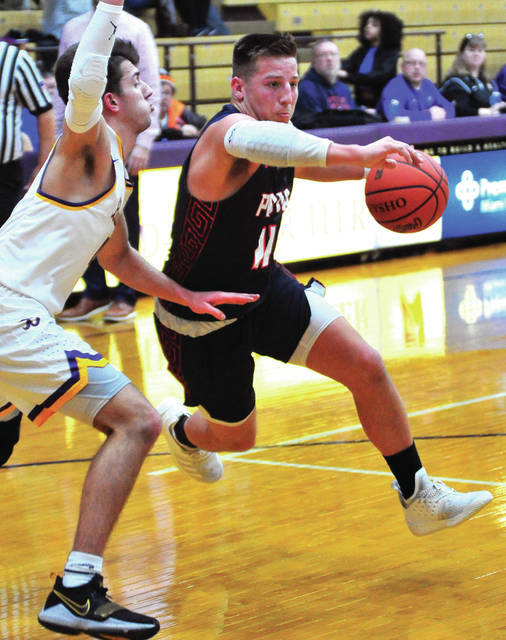 Butler maintained its shared of the GWOC North lead with Sidney, improving to 15-2 overall and 9-2 in GWOC American play. Piqua dropped to 5-11 overall and 2-9 in GWOC American play. Butler got off to a fast start, with Aviator senior Braedon Norman hitting four 3-pointers in the opening quarter. Butler jumped out to a quick 11-4 lead, but Piqua would rally. The Indians ran off eight straight points to take a 12-11 lead. Mick Karn and Qurri Tucker hit 3-pointers and Trey Richmond added a putback to give Piqua the lead. After a three by Butler’s Tyler Montegue, Piqua’s Garrett Schrubb tied it at 14 with a basket. But, Norman’s fourth three at the buzzer would give the Aviators a 17-14 lead going to the second quarter. Piqua would be within three early in the second quarter after a Richmond basket made it 19-16, but Butler would open the lead to as much as 10. While the Aviators hit eight threes in the opening half, a basket by Iverson Ventura cut the deficit to 34-27 at the break. Norman opened the second half with a three and Butler led 51-34 after a three by Ryan Wertz and a three-point play by Montegue. But, Piqua would get back within 53-43 on a three by Kameron Darner and two free throws by Karn. But Cooper Justice closed the quarter with a three to make it 56-43. Karn scored the first three points of the fourth quarter, but Butler would outscore the Indians 16-3 the rest of the way to finish off the win. The Aviators would finish the game with 12 3-point field goals. 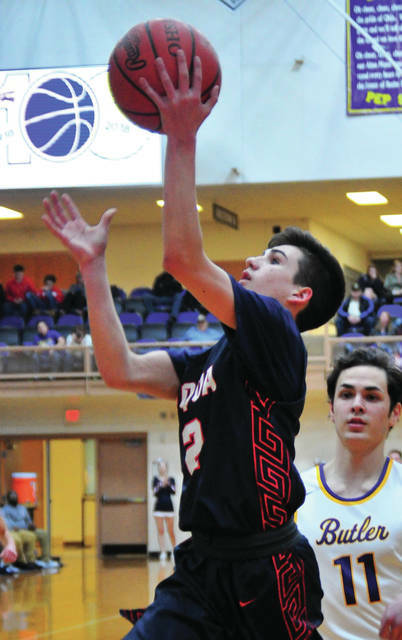 Karn had 20 points to lead Piqua. Richmond had 12 points and 13 rebounds, while Tucker added nine points. Norman led Butler with 22 points. Wertz scored 13 points, Bryant Johnson had nine points and five rebounds and Quentin Glover scored eight points. Piqua was 19 of 36 from the floor for 53 percent and six of 10 from the line for 60 percent. Butler was 28 of 64 from the floor for 44 percent and four of seven from the line for 57 percent. Piqua won the battle of the boards 29-20, but had 22 turnovers to Butler’s 6. The Indians will be back in action Friday, hosting Tippecanoe. Qurri Tucker 3-2-9, Trey Richmond 6-0-12, Zack Lavey 0-0-0, Garrett Schrubb 1-0-2, Iverson Ventura 1-1-3, Kameron Darner 1-0-3, Mick Karn 7-3-20, Riley Hill 0-0-0, Tanner Kemp 0-0-0, Caleb Lyons 0-0-0, Makeegan Kuhn 0-0-0, Cameron Foster 0-0-0. Totals: 19-6-49. Michael Krell 3-0-6, Braedon Norman 8-0-22, Bryant Johnson 4-1-9, Ryan Wertz 5-0-13, Quentin Glover 3-2-8, Cooper Justice 1-0-3, Alex Plummer 0-0-0, Tyler Montegue 2-1-6, Nick Smith 0-0-0, Matt Beverly 1-0-2, Nick Lobianco 1-0-3, Quinton Hall 0-0-0, Connor Buchanan 0-0-0. Totals: 28-4-72. 3-point field goals —- Piqua: Tucker, Darner, Karn (3). Butler: Norman (6), Wertz (3), Justice, Montegue, Lobianco. Records: Piqua 5-11 (2-9), Butler 15-2 (9-2). Reserve score: Butler 47, Piqua 14.